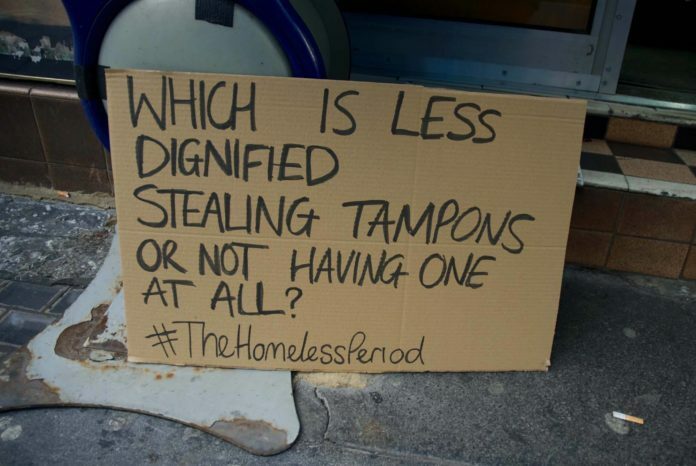 Jade Wilson takes a look at how the worsening poverty and homelessness crises are leading to a struggle in affording fundamental sanitary wear. Share the post "The chilling reality of the Homeless Period Ireland"
Period poverty is the “silent struggle” that affects many people around the world every month. A lack of access to sanitary products makes attending school or work difficult and sometimes infeasible for those who menstruate. Many adolescents who are menstruating don’t go to school due to a lack of privacy, unavailability of sanitary disposal services and water shortages. In parts of sub-Saharan Africa, students can miss out on up to five days of school per month or drop out due to insufficient access to water or hygiene facilities. The worsening poverty and homelessness crisis has also been exacerbating the issue for thousands of people here in Ireland. A survey by Plan International Ireland, conducted in 2017, has suggested that more than 50% of Irish people aged 12-19 have experienced issues around the affordability of sanitary products. The survey also found that over 61% of people are embarrassed by their period, and 59% felt that lessons on their period at school were unhelpful. Some respondents even reported having never received any lessons on their period at all. The charity Bloody Good Period estimates that the average lifetime cost of having a period is about £4,800. People with heavier flows and people with medical conditions, including endometriosis, spend more on sanitary products and medications to help with pain or reducing their flow. Regardless of what the average cost of having a period is, the reality is that even a few euros per month is actually unaffordable for those already living in poverty, who struggle to afford other necessities such as their food or rent. Charities and initiatives like Plan International Ireland and Homeless Period Ireland aim to alleviate the struggle of those living with period poverty and end taboos surrounding menstruation. The Homeless Period Ireland brings sanitary wear to those who otherwise can’t afford it or have to forgo it to feed their families. It also brings to the fore the argument that sanitary wear is a monthly necessity for a large proportion of the population and perhaps the cost is an unfair tax on a natural bodily cycle. The initiative was set up in December 2016, originally confined to Dublin, after seeing the volume of homeless people in Dublin and their lack of access to adequate sanitation. In 2017, Claire Hunt took over the day to day running of the Homeless Period Dublin and soon realised there was a nationwide need for this initiative. The decision so was made to change the name to Homeless Period Ireland and lead to an increase in drop-off points and services throughout the country. Hunt says that the HPI is an initiative, not a charity, and that it is completely reliant on volunteers for distribution and collection of sanitary products. The donations are brought by volunteer drivers to Homeless Outreach Centres, Direct Provision Centres and Women’s Refuges. UCD is also a year-round drop off point for Homeless Period Ireland, with purple boxes dotted around the campus for students and staff to deposit donations. 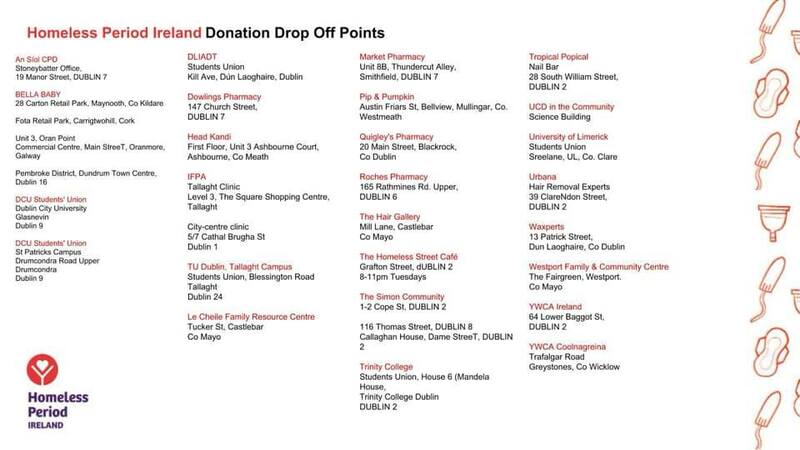 Other drop-off points include the popular city centre nail bar, Tropical Popical, as well as several pharmacies and Students’ Unions throughout the country. HPI don’t accept money – only products. They suggest that whenever we buy period products for ourselves, we pick up a second pack for someone who can’t afford it. Homeless Period Ireland also aim to reduce the stigma surrounding menstruation and educate people on the hygiene needs and financial barriers of people who menstruate. “But it’s just the tip of the iceberg,” Hunt says, adding that those involved with the initiative are eager to see the Irish government take similar actions to that of a scheme introduced by the Scottish Government in 2017. Period cups have become an increasingly popular and more affordable option for people struggling with period poverty. The cups are available from various different brands including Lunette cup and Mooncup. They are reusable for up to ten years and therefore, more environmentally friendly, but they are not cheap. Mooncups, for example, are €32 to buy. However, long-term the cups do offer better value. Some activists say that period products should be entirely free and that the cost is an unfair tax on a natural bodily cycle.